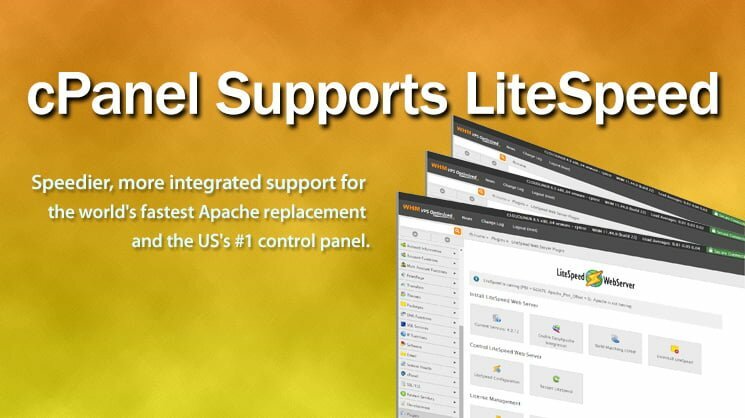 LiteSpeed Blog / Products / LiteSpeed Web Server / Official cPanel Support for LiteSpeed Web Server! You requested it. We delivered. cPanel and LiteSpeed are announcing official support for LiteSpeed Web Server users through cPanel’s ticket system. cPanel users who use LSWS will now be able to get the same great level of cPanel support that Apache users get. Just submit a ticket in the cPanel ticket system. You will not be required to turn off LiteSpeed. You will get thorough examination of your problems. LiteSpeed and cPanel are cooperating to ensure all cPanel customers get fast and complete solutions to their issues. Tickets will start with cPanel’s experienced and resourceful representatives. They have been trained in cPanel-LSWS setups and will be able to handle most issues (especially if it is not LiteSpeed-specific). LiteSpeed technicians will always be on hand, though, to address any LiteSpeed bugs or configuration problems through the cPanel ticket system. LSWS-cPanel users will benefit from faster, more integrated, and reliable support as our two support teams cooperate and engage in greater communication. LiteSpeed and cPanel’s cooperation comes partially in response to calls from the growing number of hosts using LiteSpeed with cPanel. People want and need LSWS as a way to cut resource usage and speed up their servers. Supporting LSWS empowers cPanel users to try out the world’s fastest, most efficient Apache replacement and get more out of their hardware. By supporting LiteSpeed, cPanel is helping their users get better performance and save money. Better communication between LiteSpeed and cPanel will also lead to faster compatibility fixes, better coordination of improvements, and stronger overall products for both companies. We are very excited for the continued development of our relationship with the US leader in hosting control panels. If you have a cPanel problem, go to cPanel for support. They will be able to help you, though now they can also call in LiteSpeed if they need us. If you have a problem with LSWS only — an LSWS bug, for example — it will always be more efficient to report the issue directly to us. We’d like to thank the numerous LSWS users who have pushed for this to happen. Your feedback guides us and helps make new developments possible. Edit: And here’s cPanel’s official announcement, as well. Greetings from PBSS Skills Development Center. You will help me about my server because server have close in three months but I can not understand it. so I want to remides from you. Hello. If you are having difficulty with your server, please create a ticket through our client area or by sending email to support@litespeedtech.com. We can help you better that way. Thanks! This is not correct in 2017. The first thing we were asked by cPanel was to disable Litespeed. Even though we told them in the initial ticket the problem happened with and without Litespeed running. can I install and run LSWS in digital ocean droplet? currently I use Centos? Yes, there should be no issue running LSWS on a droplet VM. IT DOESNT WORK BY DEFAULT IF YOU ENABLE “Fileprotect(prevent users from reading other webroots)” in the cpanel easyapache config options. How do you make it work right if the webroots are chown user:user chmod 750 ? Thanks for getting in touch. This was actually brought up to us by cPanel a couple months ago. LSWS doesn’t support mod_ruid2 or MPM-ITK. You’ll need to turn those (and FileProtect) off before switching to LSWS. With cPanel’s help, we designed the LiteSpeed WHM Plugin to automatically detect this setting and change it when switching to LSWS. This should work in the latest release of the WHM Plugin. The easiest way to make sure you have the latest version of the Plugin would be to upgrade to the latest version of LSWS. If it’s still not switching you automatically then, we’d certainly like to know about it.